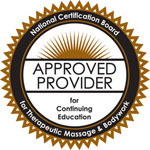 Massage Therapists renewing a license for the first time must complete 1 hour of CE for each month or partial month that has elapsed since the issuance of the license and two hours of medical errors. The one hour per month is not literal, the requirement is to have a total of 1 hour per month. For example, if licensed for 12 months, 12 total hours are required which must include two hours of medical errors. 6 live hours may be completed via Pro Bono Service pursuant to Rule 64B7-28.0095, F.A.C. At least 12 hours must be taken live and relevant to and focus on massage therapy techniques which may include the history of massage, human anatomy & physiology, kinesiology and/or pathology. These hours must be completed via live classroom instruction (including hands-on instruction or demonstration). The remaining 6 hours of general hours may include Communication with Clients and other professionals; insurance relating to third party payment or reimbursement for services; Psychological dynamics of the client-therapist relations; Risk Management, including charting, documentation, record keeping or infection control or massage practice management. 2 hours must address the Florida Laws and Rules, specifically Chapters 480 and 456, Florida Statutes and Rule Chapter 64B7, F.A.C. DVD Requirements Our DVD’s will not work for Florida for CE credit because they exceed 5 hours per subject, however our live seminars do qualify. Full Circle is an approved provider through CE Brokers — Educational Provider # 50-13651. To view more about the laws and regulations in Florida, click the following link Florida Massage Board or search the list of approved providers for the state of Florida.